Eleven stories of magic, mystery and the fantastic future, all featuring gay heroes. 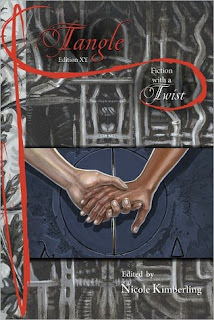 Swordsmen, cyborgs, magicians, ghosts, psychic lovers and enchanted lords fill this anthology with adventure, laughter and passion.This anthology features Spectrum Award Winning author Ginn Hale as well as award winning author and editor Lawrence Schimel and Lambda Literary Award Finalist Astrid Amara. It is very rare for me to come across an anthology where I enjoy every single story. The nice thing about short story collections by different authors is the element of surprise. After each break, the reader gets introduced to a new set of characters, encounters different situations, and is exposed to a variety of writing styles. Each story in Tangle is highly imaginative and explores love and relationships between men. Lord Ronan’s Shoes, by Astrid Amara, about a young man, Evander, employed by a king’s vassal to care for his vast shoe collection. Lord Ronan is a cold, cruel, and very attractive man. While on a mission to find new buckles for his master’s shoes, Evander comes across a very special pair of boots that changes the lives of everyone around him, including Lord Ronan. This story was sweet, humorous and a lot of fun. Remember, by Astrid Amara, is about a man who is dreading his upcoming marriage to a woman he does not love, but needs to go through with the wedding in order to gain an inheritance. The bride’s family will not allow the wedding to take place until their missing heirloom rings are found, so, at his future mother-in-law’s insistence, the groom hires a mysterious magician to locate the rings. This was a fun and romantic story that ended happily for both the bride and the groom. Crossing the Distance, by Erin MacKay, is about two boys who are telepathically bonded since childhood. Once they become of age, they are trained as “Relays”, using their telepathic skills to serve the army. A heartwrenching and beautiful story. Ginn Hale’s Feral Machines is about a lonely man who maintains a wildlife sanctuary with only the three “synthetics” he purchased from a military surplus auction to keep him company. A very imaginative, compelling, and humane story.